I am a multidisciplinary artist who works in text, music, sound, and image. Until 2015, most of my work was performative and incorporated music, video, and movement. 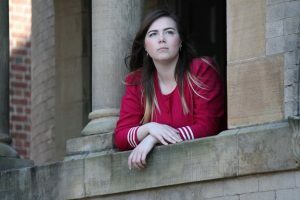 In 2015, I became ill with ME/CFS (Myalgic Encephalomyelitis/Chronic Fatigue Syndrome) and was unable to move much at all. I was also so sensitive to sound and vibration that even listening to music was painful. Reading was confusing, and writing extremely depleting. While watching a period drama, one of the women characters was told to “take to her bed and work on her embroidery,” and I thought, “I have taken to my bed. Why not do some embroidery?” My mom had some embroidery materials, brought them over, and I was smitten with the process. ME/CFS demands rest and calm. 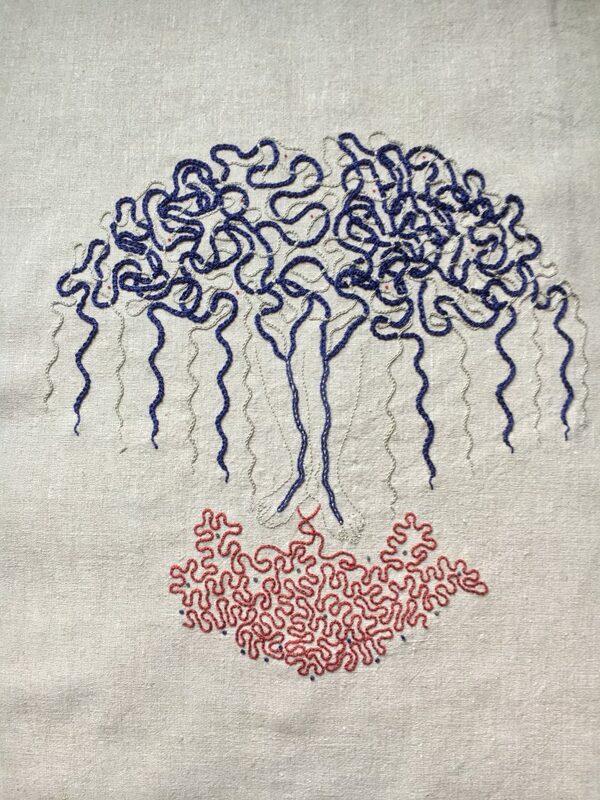 Embroidery is a slow art and something I find very restorative. My initial subject matter when I started embroidering was some of the text/image pieces I had created before my illness based on old anatomical illustrations. 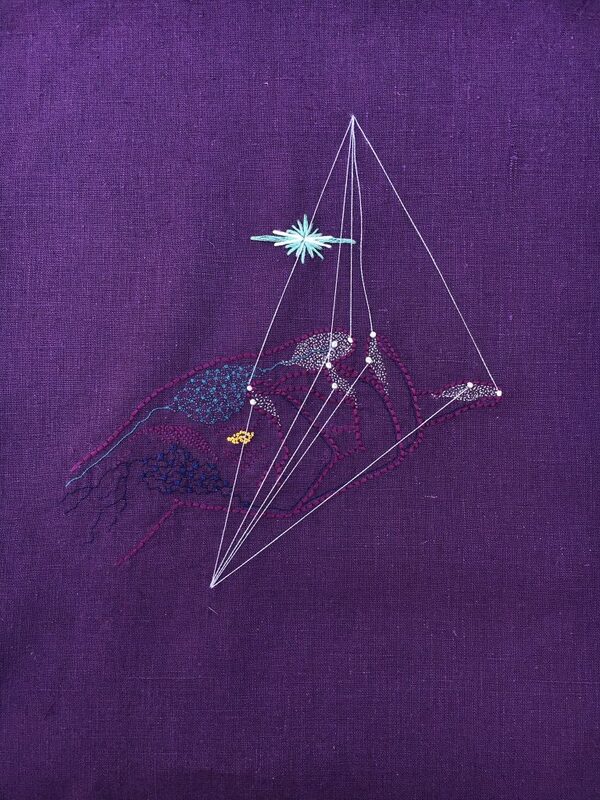 It was through these pieces that I honed my craft in hours spent reclining with needle, thread, and hoop in hands. Then one day during a meditation session I began to see all my neurological symptoms: pain, tingling, and twitches, as lines of stitching on cloth. 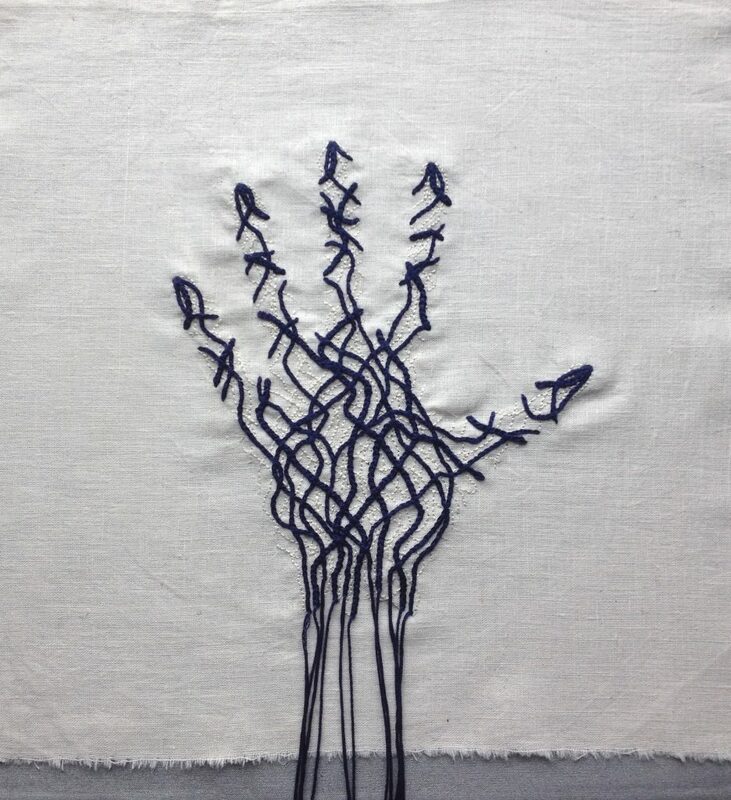 It is at this point I began to illustrate my invisible ME/CFS symptoms and have named this series “symptomatology.” I embroider primarily with cotton thread on linen but have also started experimenting with silk thread recently. For my symptomatology pieces, I start with the shape of my body or whatever body part I am focusing on. 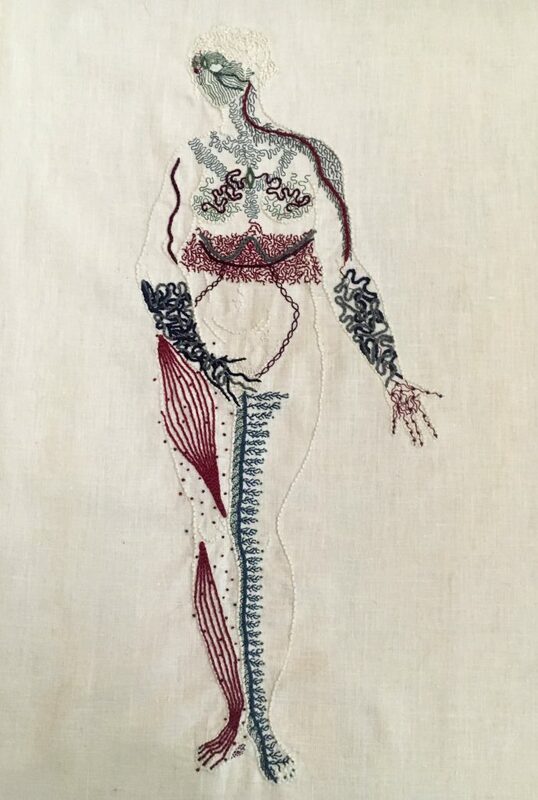 I use old anatomy illustrations or photographs of myself as a guide and then meditate on what I am feeling in the moment, stitching the sensations freehand in the moment. Lia Pas is a Canadian interdisciplinary creator who makes work as text, sound, movement, and image. 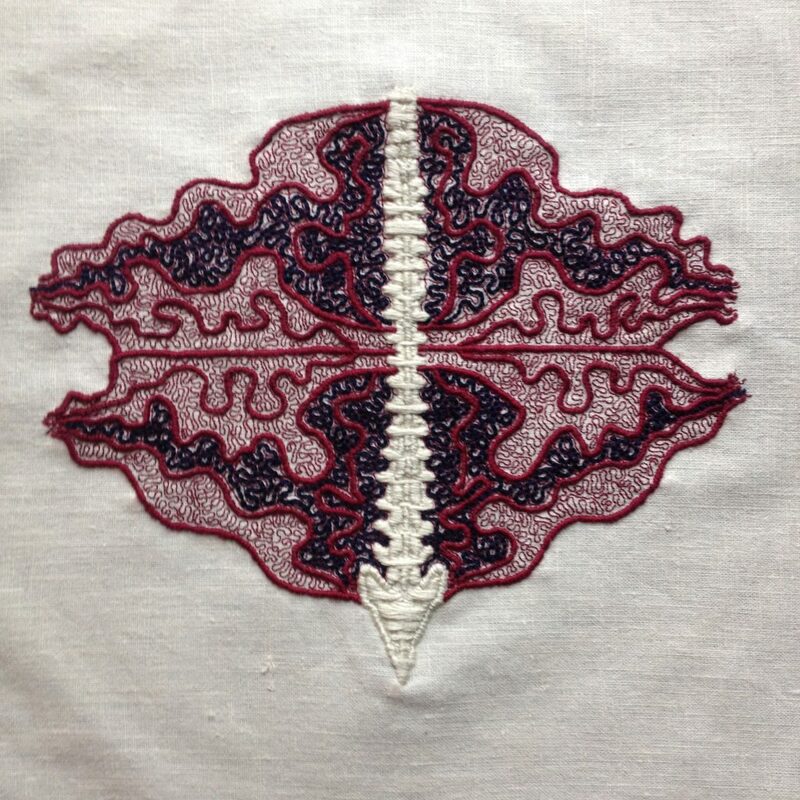 Since becoming ill with ME/CFS in 2015, Lia has focused primarily on textile-based work exploring anatomy and symptomatology. An essay on her current creative process is forthcoming in the In Copore Sano anthology (The Operating System, 2019). 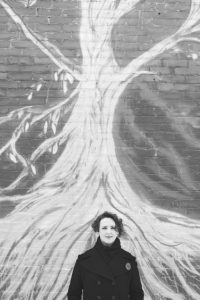 Her poetry has been published in numerous literary journals as well as in her book what is this place we have come to (Thistledown Press, 2003) and her chapbooks vicissitudes (Underwhich Editions, 2001) and Husk (JackPine Press, 2008). Her videopoem about the heart—susurrations (2009)—can be found on Vimeo. Lia’s music has been performed by chamber ensembles, used as soundtracks for short films, and broadcast on CBC and BBC radio. She has worked extensively with movement artists and was composer/librettist for Fihi ma Fihi (2015), a full-length dance-rock-opera with La Caravan Dance Theatre. She can be found online at liapas.com, on Instagram and on Twitter. For a dollop of ice cream in their nearly-too-cold cup. And not asking about the scar that ran up his spine. And the knives in my eyes. Washing down a pain pill cocktail. Icy-hot in an A&W glass. Of some sort of pain-relief cream. It sneaks up, then sneaks along. This poem originally appeared in Juliette Sebock’s chapbook, Mistakes Were Made (2017). 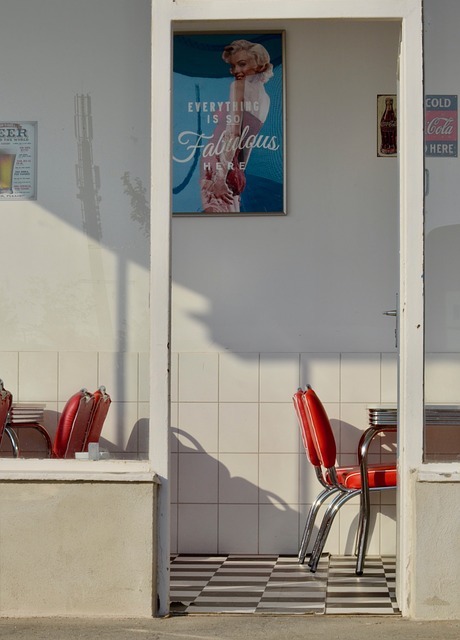 Juliette Sebock is a poet and writer born in small-town Pennsylvania. She loved writing from a young age but worked a variety of other jobs before settling on it as a career path. 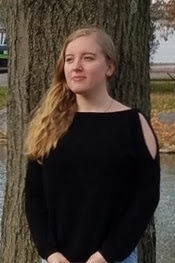 She graduated from Gettysburg College in 2018 with a B.A. in English and focuses in American and British history. After several years of undergraduate journalism and work with sources such as Her Campus Media and The Mighty, she turned her focus primarily to poetry, publishing the chapbook Mistakes Were Made in 2017. 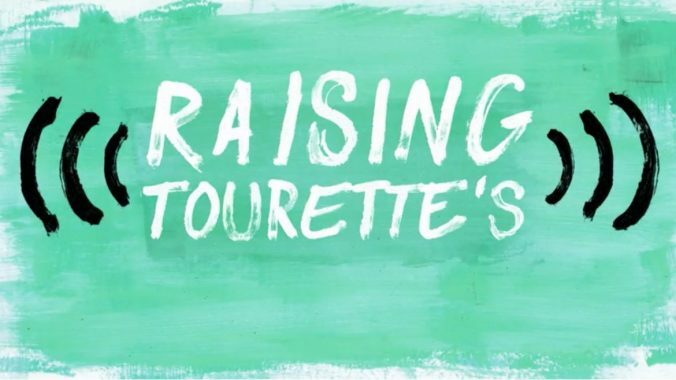 Currently, Juliette is working on lifestyle blog, For the Sake of Good Taste, as well as on a variety of poetry and prose pieces. When she isn’t writing (and sometimes when she is), she can be found with a cup of coffee and her cat, Fitz.